The time has come to set up our Windows Sharepoint Services installation to receive emails. One of the first things that you need to do is install the SMTP service on the sharepooint server using add/remove windows components. Click Start, Control Panel, Add or Remove Programs. Select the Application Server component and click Details. Select the Internet Information Services (IIS) component and click Details. Scroll down through the list and check the box next to SMTP Service, as shown in. Click OK, OK, and Next. 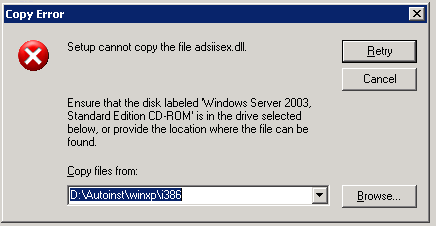 No problem, just point the browser to your i386 folder on your win 2003 cd and all is well – Wrong! It’s not there! You need to Extract the file from the cab file IMS.CAB and then point the browser to that file instead. The quickest way to do that is to fire up a command prompt and run the following command. Thanks for this, but it’s not *quite* correct – you’ve left out some slashes in the path. But never mind – very useful. Thanks for pointing that out Edward, it looks like wordpress is removing backward slashes from the post. Brilliant! Thanks, this problem was really p-ing me off. Thanks!